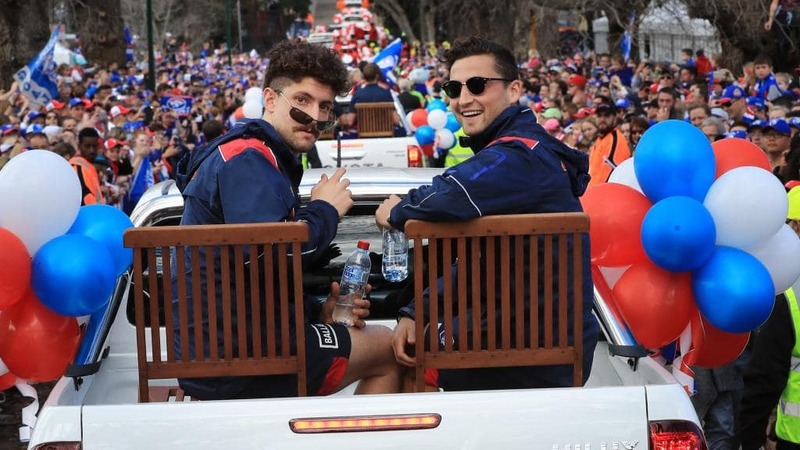 Tom Liberatore’s deliberately low profile and penchant for bizarre tattoos mean he is badly misunderstood, according to one of his closest friends. Luke Dahlhaus says Liberatore has set himself up with a strong pre-season after a turbulent few seasons and another knee reconstruction. “I think Tom doesn’t really like attention. He hates it and you wouldn’t think that with his tatts and the new one he has just got, but he hates it, he absolutely hates it. “There are times he gets noticed and he really struggles with it. But he is the most loyal, nicest bloke you would ever meet and he’s been such a good friend to me. “He loves to have a beer and stuff, but people think he’s a bit more loose than what he is because of the tattoos and he’s a bit different. “But honestly, he’s the nicest bloke, so loyal and the best bloke you will meet. Liberatore just added another two tattoos to his arms - a pair of matching Simpsons characters - but not even Dahlhaus can explain them. “I don’t know. A lot of them have a story behind them so you might have to ask him,” he said. “There are a few from our trips and they all relate to something. Oh come off it. Doesn't like attention in what way? From his colourful shirts, to shaving the crown of his head and running around on a footy field in Asia. The bloke loves attention. As long as he does his job I don't mind at all. It’s quite funny actually as I had a chat to him at a VfL game and he was very friendly but also very shy. I would say he is a very quiet and reserved person unless he is in company he knows. He definitely has the very likeable rogue persona in the media but I don’t really think it’s him. The tatts etc are a shield I think, knowing that he will have the attention as an AFL player and SOT. He's quiet, but outspoken in his own way. What I like about Tom is he seems like the kind of guy that would always be there for his mates. It's not always the best "company" and the best look, but he is certainly loyal. Don't buy it. Shy or socially awkward? This is the guy who gave Shaw a big look at his tonsils all game in the GWS 2016 prelim. Jarrad Grant I would class as shy. Call me a cynic. These Women's weekly type articles about how good such and such a bloke is and he's such a nice bloke make my eyes roll. Time machine, transport me back to the days when men wore tight shorts and wooly jumpers, and footy papers were interested in skills not fashion. I'm going full curmudgeon, pooh-poohing Simpsons tattoos ( unless it's a Simpson in blue red and white. That's ok ). Now, I am going back to my blanket and rocking chair. Last edited by Ghost Dog; 02-03-2019 at 05:29 AM. Don't buy it. Shy or socially awkward? This is the guy who gave Shaw a big look at his tonsils all game in the GWS 2016 prelim. Jarrad Grant I would class as shy. Call me a cynic. I agree he isnt shy, but I think you are slightly misinterpreting what Dahl is driving at GD. Libba isnt shy, but rather reserved in public and a complex mix of personality traits. Libba is a clown within the group, life of the party etc, and probably an attention seeker within the group, but for the broader 'footy' public he's never sought nor craved that attention. He's the son of a champion who probably had people tell him how good his dad was from the time he could crawl (and his dad was F***ing good IMO). You can understand why he'd shy away from that, and needed to become his own man. In that way I would say he is a character who is misunderstood - hes never wanted to conform to being a 'footy head' who does media and craves the broader spotlight. In most of his footy he has been a fierce competitor who lives for the contest - will rile an opposition player to get himself or the group going - will say whatever he thinks he has to in order to get the team up. Having played in teams - hes the kind of competitor who would likely be revered behind closed doors for his feats, occasionally bemoaned for his incidents, but respected and loved. Haha. Are you Red Symonds? Barrett's going to have a field day with this. Don’t give Barrett any ideas! I hope not! apparently I cry every day at the moment. Get well soon the real Red Symons. I've only met him twice and both were very brief encounters. But the attention he gave my son in the second encounter was exceptional. He signed his jumper and spoke with him for three/four minutes. In a crowded room, with hundreds of kids wanting his autograph, his attention never wavered from my son in that time. For an aloof character, he certainly has a way with the younger fans.